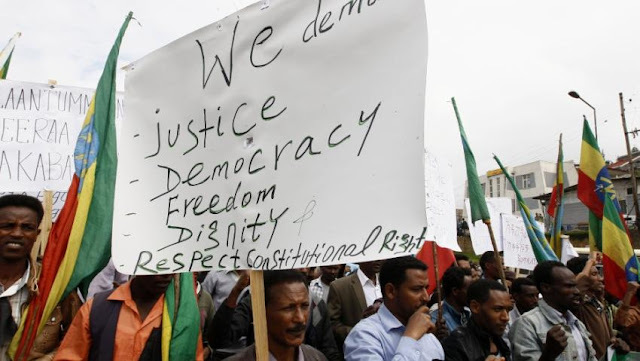 (Green Left) — For the past 26 years, Ethiopia has been ruled by an authoritarian government. The party in government is the Tigrayan People’s Liberation Front (TPLF) — a very criminal group. The TPLF represents the interests of just one of the tribes in Ethiopia, the Tigrayan people. The control the TPLF has over Ethiopia is therefore an undemocratic one, because the Tigrayan people only one tribe out of many that has historically lived in Ethiopia. All of Ethiopia’s tribes, who have lived there for centuries, deserve ownership and representation within Ethiopia. The problem now, and for the past 30 years, has been that the TPLF have been the dictators of Ethiopia, and have been brutally putting down the rest of the tribes in the country through terrible violent and underhanded means. One of the TPLF’s favourite methods of control of the population is fostering inter-religious conflict within the country. This is a classic divide and rule tactic. We know this strategy well from the time of colonialism. The TPLF likes to ferment conflict between Christians and Muslims. This helps prevent the population from uniting against their tyranny and overthrowing its authoritarian government. The conflict the TPLF likes to foster does not stop with religious identity. It also extends to ethnic identity. There are many tribes within Ethiopia, and they all have a beautiful history. They all deserve representation. But the TPLF pits them all against each other. The conflict that the TPLF drives was unprecedented before the rule of this dictatorial party. An example of the inter-tribal conflict is how the regime exiled the Orthodox Church synod from the country. It removed all the legitimate representatives of the Orthodox Church from their positions, and replaced them with people from the Tigrayan people. This forced former church leaders into exile and they currently reside in the United States. The people that the TPLF unjustly installed as leaders of the Orthodox Church are not recognised as the legitimate leaders of this community — the Ethiopian people still recognise the former leaders of the church. Another concrete example of TPLF crimes is the actions of federal affairs minister Abay Tsaheye. The TPLF has been stealing the land of other tribes, such as the Gambela people. To carry this out, the TPLF sends in its own army — the Agaze army — into other people’s lands and they commit genocide against these tribes. Tsaheye has been accused of ordering these killings. The TPLF take land to gain control of precious minerals, fertile arable land, and significant oil reserves. The strategy of the TPLF is clear. They rule the country with an iron fist and steal resources from the lands of other tribes. The mastermind of the TPLF is communications minister Bereket Simon. He exercises control over Ethiopia’s media, running spin campaigns to distort public discussion about what is going on in the country. Simon twists the stories that people try to tell about the atrocities the TPLF and Agaze army commit, preventing people from getting a clear picture about the genocidal acts of the illegitimate government. Another criminal TPLF leader is Tedros Adhanom. A former health and foreign affairs minister, he was appointed last year as World Health Organisation (WHO) director-general. Adhanom was guilty of covering up three cholera outbreaks in Ethiopia in 2006, 2009 and 2011. United Nations officials said that if Adhanom had correctly reported the mass outbreaks of illness such as cholera, more vaccines and medical help could have been sent to the country to prevent further spread of injury and death. Instead, Adhanom chose to report the mass outbreaks of illness as “acute watery diarrhoea”, which is a significantly less severe illness. So he is responsible for knowingly killing people. It is a crime that this man has been appointed to the well regarded and respected position of heading the WHO. There is a silver lining to this dark cloud of TPLF rule. The people of Ethiopia do not listen to the media spin of the ruling party, and are waking up to the illegitimacy of its rule. They are very swiftly realising that the ruling strategy of the TPLF is the same as that of Western colonial governments — divide and conquer.